With 1986’s Ready for Romance, Modern Talking scored their biggest hit with ”Brother Louie”; however, after 1986’s In the Middle of Nowhere, tensions between Bohlen and Anders reached a boiling point, and following the release of their fifth LP, Romantic Warriors, Bohlen assembled a new project, Blue System. 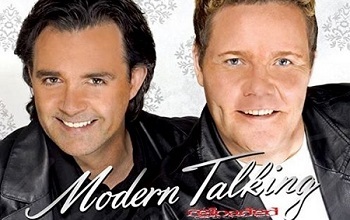 Modern Talking Reloaded continues the great career of the original German duo. MTR has toured for 20 years all over the world, including South-America, Russia, Europe..and brought thousands of Modern Talking fans to festivals and night clubs. Entertaining and simply amazing duo André & Micha are ready for stages again, and the story continues.. Modern Talking Reloaded bookings go on!